Voodoo fits in a world picture that goes back thousands of years in the history of West Africa. In this world all life on earth – plants, people and animals – consists of mind and matter. Matter is transitory, the mind will continue to exist. The Gods to whom the voodoo convents are devoted, are at the head of the world of the spirits. The spirits of the ancestors are also in this world. 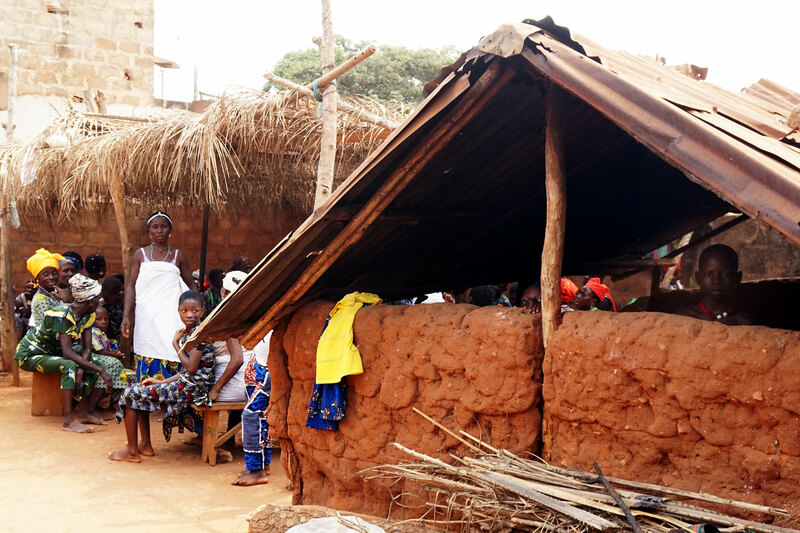 Everywhere in Benin, there are voodoo convents, secluded courtyards with a little temple where the ceremonies take place. When children are taken to a convent, for example to cure them, they sleep under a lean-to in the courtyard. In the district of Couffo alone there are 915 convents spread over six parishes. In Benin voodoo is recognized as a religion. The convents are only accessible to insiders: men, women and children that have undergone the required initiation ceremonies. They are responsible for many ceremonies, the rituals and the sacrifices to propitiate the Gods. When a child is seriously ill and both doctors in hospitals and the traditional healers cannot find any cause, many parents seek the help of voodoo priests and priestesses. For them illness is a symptom. Disease, accidents and disasters are the result of a disturbance of the balance within the community of people or of the balance between the world of the people and the world of the spirits. In order to find the cause of this disturbance the Fâ is consulted. Parents visit a bokonon, a wise person, who can read and interpret the judgment of the Fâ. A bokonon throws a chain with eight half nutshells which can drop down in 256 different ways. Behind each of the 256 signs, age – old knowledge is hidden in the form of legends, parables and proverbs. With the help of the Fâ , the bokonon will find the cause of the disease. The Fâ also determines to which God people should go for help to remove the cause and with it also the disease. The child is taken to a convent dedicated to the God shown by the Fâ. It undergoes the initiation and with this is placed under the protection of the God, after which it will be cured. In order not to fall ill again, the child cannot leave the convent till the God’s wishes are met. Again it is the Fâ which determines what sacrifices need to be paid. Mostly they are cola nuts, palm oil, liquor and the blood of goats or chickens. As long as this debt has not been paid, the child will stay within the walls of the convent and dedicate its life to the God that offers it protection. Very often parents cannot not pay the many sacrifices. The result is that the child has to stay in the convent till the debt has been paid. This may take years. Because of this, the children cannot attend school. Isolated behind the walls of the convent, they lead a life totally dedicated to Voodoo. Thousands of children live in voodoo convents, often in very primitive circumstances. Strictly separated from parents, family and school, their lives are led dominated by the God venerated in the convent.